Show your support and raise awareness for AIDS or heart disease (the color red represents either of these diseases). 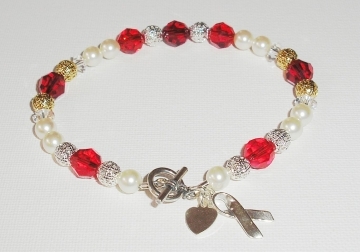 Make this gorgeous AIDS awareness bracelet or heart disease awareness bracelet and wear it yourself or give it as a loving gift to someone close. You've seen these bracelets selling for upwards of $100, so why not make one yourself and save, or sell them at your next jewelry party? Features genuine sparkling Swarovski crystal beads and pearls, silver and gold plated filigree beads, and a quality sterling silver clasp, ribbon, and heart charm. Gather your supplies. You can BUY the complete BRACELET KIT here, or purchase charms and supplies from your favorite bead store. Here's what you'll need. 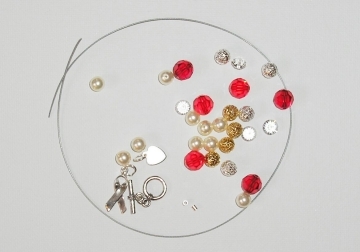 Smaller clear crystal spacer beads as accents (quantity as desired). I used 4 spacer beads in my design. Swarovski crystal pearls, or freshwater pearls (quantity as desired for proper length of bracelet), I used 10 beads in my design. Decorative sterling silver or silver or gold plated beads for accents. I used 10 beads in my design. Length of flexible beading wire like Soft Flex or Beadalon. Enough for length of bracelet plus a few extra inches to work with. You can do this first on a bead design board if you prefer, but I always like to wrap a bracelet around my wrist just to check the look and fit. Make sure you account for the added length of the clasp. I spaced my beads to end up with a bracelet that was 7.5 inches long. 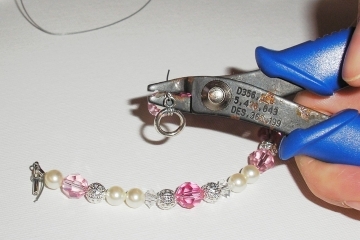 You will use your pliers to open the split jump ring on the charms, and attach it to the end loop of the round clasp. Close the jump ring so the charms are securely fastened. Follow the instructions on how to properly open and close jump rings, here. 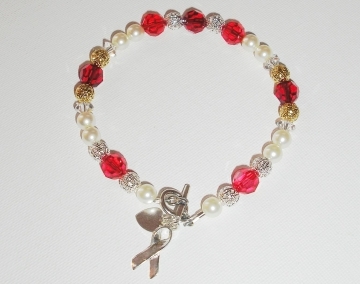 That's it, your gorgeous new Awareness bracelet is ready to wear or give as a gift! Enjoy!